No… this isn’t Russel Fink. This is Mike Snyder the author of the book. There is one thing about Mike Snyder and that is he is extremely unusual. His wit is a bit on the weird side, but that does not make it any less hilarious. He’s been working hard on this novel for a long time. I remember the day I first heard about this character named Russell Fink. It was a short story and it was such a striking story it stayed with me for the past two years. That story was about Russell Fink, and his fiancÃ© was a lot more whacky, and not as likeable. Russell is a copier saleman who is just going through the motions and staying just ahead of the pink slip because his boss loves him as much as his boss’s son hates him. It just so happens that I sat down with Mike and got him to answer some questions. I’ll share them with you right now. Mike â€“ I noticed at the bottom of one of your short stories a thought process on how you developed your story. I also noticed (and you mentioned it, too) that “My Name Is Russell Fink” has some overtones and flavors â€“ oh, all right â€“ looks a lot like some of your short stories, or rather, three of your short stories are imbedded in your novel. What role did those stories play in how you built your plot line? I love reading and writing short stories. Itâ€™s a different discipline than novel writing. A short story requires precision and brevity. At the same time, thereâ€™s more flexibility when it comes to form or structure or plot (Or in my case, lack of plot? The plot in MNiRF was not so much â€œbuiltâ€ as it was â€œtripped overâ€). I think what Iâ€™m going for in a short story is an emotional snapshot. 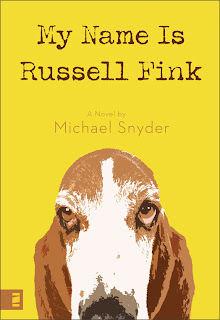 For instance, the â€œsadderâ€ parts of Russell Fink grew out of a much darker story about an entirely different character. Also, shorter works are also a great way to see if the story/character Iâ€™m working on has any kind of staying power. Did you ever chase a rabbit while writing and have to scratch a chapter? If so, what happened? Thankfully my editor did most of the chapter-scratching for me. And Iâ€™m really glad he did. My ratio of seat-of-your-pants writing vs. outlining used to be ninety-nine to one. Now Iâ€™m about 75/25. I do love the freedom and surprise and spontaneity of making things up as I go along. But itâ€™s easy to write yourself into a corner without an outline. And I must admit I do this routinely. Itâ€™s time-consuming and frustrating, but I believe itâ€™s a healthy part of the process. Stillâ€¦sometimes a throwaway scene will have at least one great metaphor or one juicy paragraph that crystallizes some vital part of a character that you might have missed without writing the scene that got cut. I choose to believe that thereâ€™s no such thing as wasted writing. Did Russell and his dad finally become friends or do they still have a lot of work to do in their relationship? Hah, Iâ€™m not sure I have a good answer for this one. The most honest answer I can give you is, â€œI donâ€™t really know.â€ But whether or not they actually become friends one day, theyâ€™ll still have a lot of work to do. And thatâ€™s okay. Weâ€™re all a bit of a mess. Russell and his fatherâ€™s dysfunction just happened to be played out between the covers of a book. And not to get too weird here, but I look at stories the same way I look at comedy. Iâ€™ve been told a time or two that Iâ€™m funny (see question #5). And I suppose thereâ€™s some truth to that. But I think it has more to do with training your senses to pick up on humor. I donâ€™t create funny things; rather I observe them, then point them out to others. Most â€˜funny peopleâ€™ are merely conduits whoâ€™ve honed their timing and delivery, and are willing to risk not being funny.Itâ€™s the same with stories. The reason I canâ€™t be sure about what happens to the characters after the last page is because I never really got that far. I sort of went along for the ride, transcribed as much as I could, and hoped it would all turn out okay. So itâ€™s hard for me to claim too much ownership of the actual story or predict what happens after The End.Which character was the most fun to write and why? Which character was the most fun to write and why?Wow, thatâ€™s tough. And my easy â€˜cop-outâ€™ answer is: â€œWhichever one I was writing at the time.â€I really did enjoy writing every single character. I love them all. But if I had to pick only one, I guess it would have to be Dan. Iâ€™m sure there will be readers who deem him unbelievable, but I feel like I really know Dan. Although they have very little in common, he sort of reminds me of the roommate in the film Notting Hill, annoying but lovable.Dan actually was fun to read, too. Sort of a surprising character (and vocation 🙂 Did you ever just crack yourself up and laugh out loud while writing? Which part was it? Dan actually was fun to read, too. Sort of a surprising character (and vocation 🙂 Did you ever just crack yourself up and laugh out loud while writing? Which part was it?I think I remember laughing a few times, probably at Russellâ€™s Battle of Jericho chant or the scene where he describes the doctorâ€™s office. But truthfully, my emotions ran hotter in the other direction. I probably teared up twice as often as I laughed aloud. And thatâ€™s not an altogether bad thing. But thereâ€™s nothing I like more than amusing people. So just the fact that you asked the question makes me all warm and fuzzy. Okay, maybe just warmâ€¦I did shave today. Dan actually was fun to read, too. Sort of a surprising character (and vocation 🙂 Did you ever just crack yourself up and laugh out loud while writing? Which part was it?Sadder parts? Mike there weren’t that many, it was such an upbeat book. Which sad parts got to you? The sad parts (if I can remember them all) were mostly about Katie. I think there was a really tender dream scene that got cut as well. And then Gramps’ funeral was really an emotional scene to write. Again that got pared way back, but it will be interesting to read it all again and see if those parts hit me the same way? What was the best advice ever given you concerning your writing career? Write every day, or close to it. And if you donâ€™t love what youâ€™re writing, donâ€™t bother. Oh, and read, read, read! Read what you love and read over your head. Then read some more. What tips do you have to offer aspiring writers? For starters, I would ditto my last answer. But that would be too easy. So Iâ€™ll go with this one insteadâ€”donâ€™t worry so much. Not about the rules or getting published or whether everyone likes your writing or whether youâ€™re any good or notâ€¦and especially donâ€™t worry so much about the results. Just read a lot, pray a lot, and write a lot.Iâ€™m not advocating a bury-your-head-in-the-sandbox strategy, not by a long shot. We should all track our progress and make sure weâ€™re getting better. And getting published is a great goal to have, and as such, there will be a few worrisome details to deal with. But please keep all that to a minimum. The single best thing any writer can to is to keep on writing and never lose the joy in the process. Those are things we can control.What did you learn about God while you were writing this story? How has that impacted your life? What did you learn about God while you were writing this story? How has that impacted your life?I think I got more reminders than any sort of new revelation. I was reminded that God has a sense of humor, that He loves stories, that no matter what our past is like or whatever batch of dysfunction or neuroses we throw at Himâ€¦that He will do what He does. He loves and redeems the lost and lonely and broken-hearted. Stories are a really good way to remember those truths. Thatâ€™s hardâ€¦and a wee bit tricky on your part too! Letâ€™s seeâ€¦Question: As far as the themes in the novel, were those thought out ahead of time and worked into the manuscript? Or not?Answer: Not. Itâ€™s pretty funny, actually. Iâ€™m reading Russell Fink again now (just got my first copy in the mail this past Friday!) and am seeing things I didnâ€™t notice the first ten times I wrote it. To me itâ€™s just further proof that God is the ultimate writer. His very long love letter to His children is read every day by millions and millions of people. But there seems to be no end to the â€œnewâ€ revelation He pours out on us through His words. (And for the record, I did NOT just compare my writing to Godâ€™s. For one thing, Heâ€™s been at this a lot longer than me. Plus, Heâ€™s got that whole Iâ€™m-God-and-Youâ€™re-Not thing in his favor too.) By His ultimate design, the written word speaks far beyond whatâ€™s actually on the page or what was in the brain of the writer at the time. And thatâ€™s a good thing too. Thank you for allowing me to come over and play on your blog, Gina, It was a treat. And thank you to anyone who read this far. 4 users commented in " “My Name Is Russell Fink” by Michael Snyder "
Mike, My name is Mark Whitlock and I am a freelance writer in Franklin, TN. I attend Christ Community and enjoyed reading in the Chronicles about Russell Fink and his special powers. Congratulations! I’m so excited for you. I’ve been nibbling away at my novel for years as I write for other people. To make a long story short, I’ve figured out a way to squeeze six months out of life to finish…while still keeping the bills paid. I hope to meet with as much success as you’ve achieved. Way to go! May God shock your socks off with the response. Are you the Michael Snyder who went to Quito Elementry School, lived across the street from me on Yorkton Way, San Jose?